In almost three decades of research and writing on Gaza, I have often asked myself, “Is there a language to really express the torment of Gaza and the way in which the world’s unflinching indifference and heartlessness contribute to it? Gaza’s present anguish did not emerge in a vacuum nor in response to a single terrible event as the Israeli government would have us believe. Instead, it emanates from a context of ongoing occupation and repression that has transformed Gaza — the center of Palestinian nationalism and resistance to Israeli occupation — into one of the most impoverished, imprisoned areas of the world. 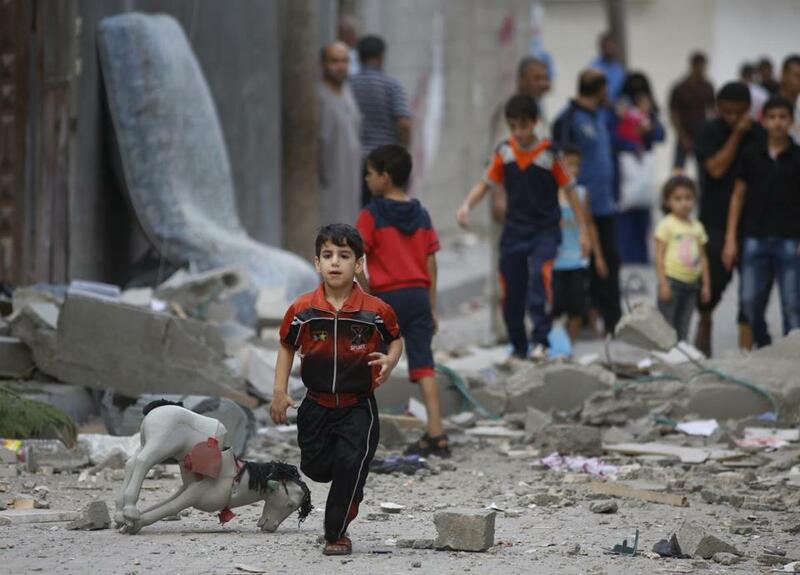 Gaza’s deterioration, however, was not accidental or inadvertent. To the contrary, the devastation of Gaza’s economy (and environment) was deliberate and planned by Israel, imposed through separation and isolation and through a destructive economic blockade, which entered its eighth year last month. The blockade — which has been supported by the United States, the European Union, and Egypt in particular — virtually bans access to markets outside Gaza and confines the overwhelming majority of people to the Strip. This has ended all normal trade upon which Gaza’s tiny economy depends and has disabled the private sector and its capacity to generate jobs, preventing any viable recovery of Gaza’s productive sectors. Another way to understand the impact of the Israeli blockade is this: In 2000, UNRWA (the UN agency responsible for Palestine refugees) was feeding 80,000 people in the Gaza Strip; today it feeds over 830,000 people. Yet, UNRWA’s food aid to almost half the population is now under threat as some international donors such as Canada have inexplicably defunded UNRWA or fund at levels that do not meet Gaza’s burgeoning need. Without an increase in financial support to cover a $22 million shortfall, UNRWA may have to eliminate its food distributions by the end of 2014. If this happens there should be no doubt that Palestinians in Gaza will face starvation for the first time in their history, and the violence that will ensue from their deepened agony and abandonment will be calamitous. The profound deprivation that has long defined life in Gaza is intensifying. Israel is deliberately targeting and bombing civilian infrastructure with the aim of ensuring Gaza’s continued decay. Even before Israel’s ground invasion, water and sewage treatment facilities in 18 different locations sustained damage, and presently, 900,000 people — half of Gaza’s total population — have no access to water. Fifty percent of sewage pumping and wastewater treatment systems are no longer operational, largely affecting Northern Gaza, Gaza city and Rafah. Damaged pipelines have resulted in the mixing of sewage and water, raising the risk of water borne diseases, a serious public health hazard. Several power lines have also been disabled by bombardments, leaving 80 percent of the population with only four hours of electricity a day, and critically disrupting the delivery of basic services, especially in hospitals. Israeli warplanes have destroyed or severely damaged between 1,660 and1,890 homes and have inflicted significant damage to at least 1,420 more, displacing around 50,000 people, according to the UN Office for the Coordination of Humanitarian Affairs; 48,000 of the displaced are sheltering in 43 UNRWA facilities. Israeli airstrikes have also attacked a range of institutions including: UNRWA installations, hospitals, health clinics, nursing care centers, rehabilitation centers for the disabled, schools, sports clubs, banks, mosques and office buildings. Hamas’s targeting of Israeli civilians is also criminal and has achieved little for Palestinians. Instead of stopping Israel, Hamas rocket fire provides a continued rationalization for Israeli aggression on a nearly defenseless population.